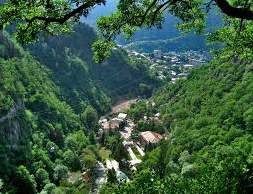 The Kakheti tour offers a day in one of the most beautiful regions in Georgia. The very best wines come from Kakheti. Almost three-quarters of the county's wine grapes are grown here. Archaological findings have suggested that wine has been produced here for several thousand years. Almost every village in Kakheti is well known for its own sort of wine, such as Kindzmarauli, Akhasheni, Teliani, Mukuzani. Wines are named after the places where they are produced. 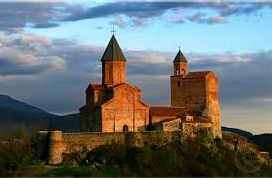 Trip to Kakheti includes several tourist destination, such as Monastery of St. Nino in Bodbe, Sighnaghi – City of Love. On our way we will taste Georgian bread called puri. Puri is traditionally baked in a deep circular clay oven called tone. During the harvest season, we will also visit one of the biggest wine factories in Kakheti, where you can taste and buy wine. Excursion is accompanied with the guide in English and Russian, and provides best value for families, friends, couples and solo travelers. - Entrance tickets to museum. On our tour to Ananuri-Kazbegi mountains you will have an exciting drive, heading north along the Georgian Military Highway into the high Caucasus Mountains. This is the main road running for 220 km from Tbilisi to Vladikavkaz in Russia, a spectacular highway that winds its way through sheer mountains. 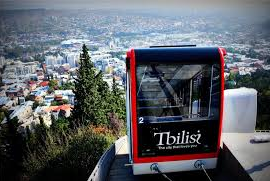 This route actually dates back to 1st century BC and is still important as the only link connecting to Russia through Caucasus Mountains. 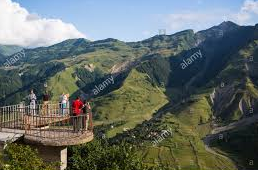 Trip to Ananuri-Kazbegi includes several touristic areas, such as Ananuri architectural complex and Zhinvali water reservoir, Gergeti Trinity Church and Kazbegi village. 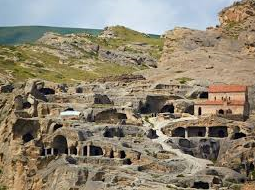 On our tour to Gori-Uplistsikhe you will have an opportunity to visit several sites from different times of Georgian history, such as Uplistsikhe cave town, Joseph Stalin’s home museum and Gori fortress. Excursion is accompanied with live guide in English and Russian, and provides best value for families, friends, couples and solo travelers. Our tour to David Gareja monastery complex offers you an opportunity to visit a rock-hewn Georgian Orthodox monastery complex located on the half-desert slopes of Mount Gareja dating back to 6th century. 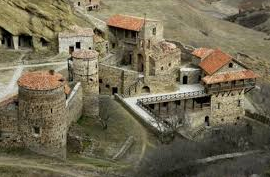 Our tour to three destinations of Vardzia (caves from 12th century), Rabati (medieval castle of Asian style) and Borjomi (picturesque resort town) offers you a unique opportunity to visit contrasting sites of several historical eras within just a day! 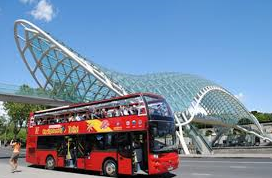 City sightseeing Tbilisi red bus tour is the most convenient way to get oriented in the city, especially for the first time visitors. Tour ticket allows you to hop on & hop off our double decker bus at any stop within 24 hours, and explore the city at your own pace. 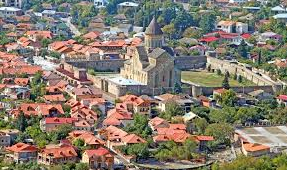 Mtskheta day trip offers you to escape the city and visit the oldest city of Georgia within just few hours. 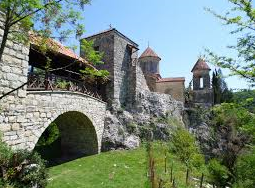 During the tour, you can enjoy panoramic aerial views of mountains around Jvari Monastery, observe the confluence of Aragvi and Mtkvari rivers, or have a time trip back to early centuries in the area of Svetitskhoveli cathedral and Samtavro church, at the end of the tour you will taste Georgian wine. Excursion is accompanied with guide in English and Russian, and provides best value for families, friends, couples and solo travelers. © Tribeca 2019 All Rights Reserved.